More info:From £840 - £875 excluding flights. Prices based on 2 adults sharing. Single supplement available. Mimimum age 14. 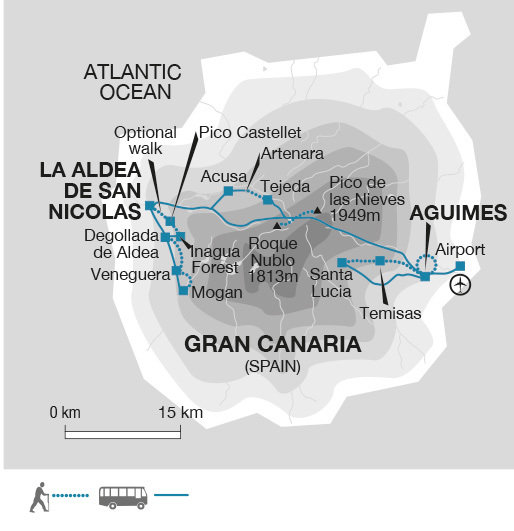 On this in-depth tour of Gran Canaria we stay in a small, locally run hotel well away from the tourist hub to get an authentic feel of life in the Canary Islands. As our tour leader is from the island we'll get a unique insight into island life - something most visitors never experience! Our main mode of transport on this trip is our own feet and all other transport is provided by local companies, supporting the local economy, as well as using public transport on some occasions to reduce the need to charter transport specially. All tap water in the Canary Islands is readily drinkable, so we urge you to take and use a water bottle rather than buying water to reduce pressure on the small islands’ limited resources for dealing with plastic waste. We stayed in a small town 1.5 hours from the airport in a locally run hotel. There were few restaurants in the town and my impression was the group provided very welcome business to the town. The food appeared to be very fresh and locally produced. As a group we made little environmental impact as simply spent the days walking mostly using public transport. I thought the holiday was excellent as the members of the group got on exceptionally well with the ages and abilities very well matched. As far as walking, fresh air, scenery and local food was concerned I would only recommend. However, if one were looking for varied, gourmet food with a vibrant night life the town would not provide it. This to me was an advantage but if evening socialising was sought you might be disappointed. From my point of view it was ideal.